Democrats and Republicans in the General Assembly held their traditional post-election caucuses Thursday, selecting new Democratic leadership in the Senate and new Republican minority leaders in both chambers. Rep. Themis Klarides, R-Derby, was elected House minority leader, becoming the first woman to lead the GOP in the House. 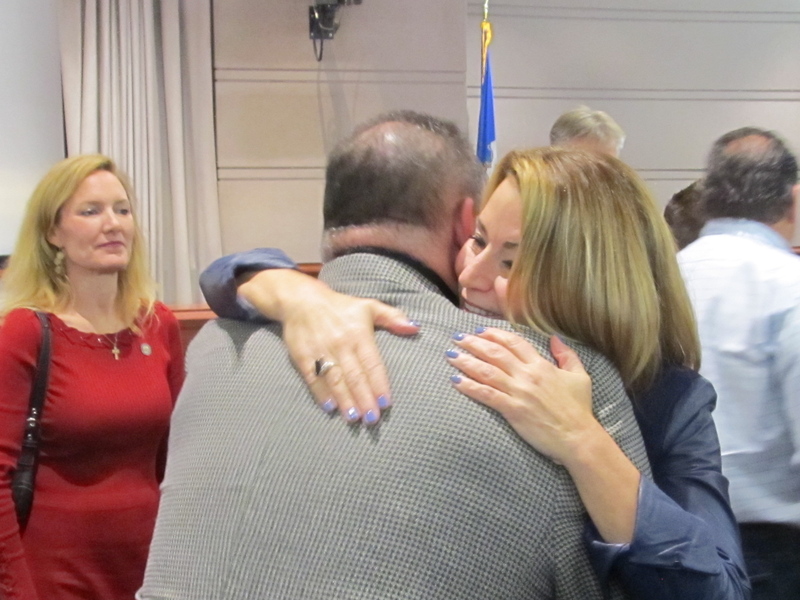 She was chosen by acclamation after a rival, Rep. Jason Perillo, R-Shelton, withdrew. The new Senate leaders will be: Sen. Martin M. Looney, D-New Haven, president pro tem; Sen. Bob Duff, D-Norwalk, majority leader; and Sen. Len Fasano, R-North Haven, minority leader. House Speaker J. Brendan Sharkey, D-Hamden, and House Majority Leader Joseph Aresimowicz, D-Berlin, will retain their posts. Gov. Dannel P. Malloy and Lt. Gov. Nancy Wyman, Democrats re-elected to a second term Tuesday, waited outside the closed House caucuses to congratulate the winners in both parties. “When they are voting on the floor we don’t necessarily agree, but there’s always issues we have to work together on, you know, bonding issues or projects of things they want to get done,” Malloy said. All six leaders were selected without opposition. As overall leaders of the two chambers, Looney and Sharkey will be elected by the membership on Jan. 7, when the General Assembly convenes for 2015. Looney, the majority leader for a dozen years, succeeds Sen. President Pro Tem Donald E. Williams Jr., D-Brooklyn, who did not seek re-election. Williams was the longest-serving Senate leader. Duff succeeds Looney. Fasano succeeds Senate Minority Leader John P. McKinney, R-Fairfield, and Klarides succeeds House Minority Leader Lawrence F. Cafero Jr., R-Norwalk. Neither GOP leader sought re-election. The House GOP caucus was the last to elect a woman as leader. Among the new House members is 20-year-old Aundre Bumgardner of Groton, a black and Latino Republican elected from the 41st House District of Groton and New London. He is believed to be the first black Republican elected to the House in four decades. He unseated a four-term incumbent, Democrat Elissa Wright, winning by 39 votes. Democrats will control the House, 87 to 64, and the Senate, 21 to 15. Sen. Kevin Witkos, R-Canton will be Fasano’s deputy, holding the title of Republican leader pro tempore. Klarides named no deputies Thursday. The GOP picked up one state Senate seat Tuesday night and came close in two more races, a disappointment given that the Democrats were defending five open seats. “Our guys worked very hard, and it was close,” said Fasano, who has known for months he had the votes to succeed McKinney, who ran unsuccessfully for the GOP nomination for governor. He conceded a certain frustration at watching a Republican tide sweep across the nation, yet barely touch Connecticut — aside from a big gain in the state House of Representatives. Gov. Dannel P. Malloy, a Democrat, was re-elected with 51 percent of the vote over Republican Tom Foley. After picking up 10 seats Tuesday, the House GOP is at its strongest in 20 years. Republicans have gained 27 seats over the past three elections. After Barack Obama carried Connecticut by a landslide in the 2008 election, they were outnumbered in the House, 114 to 37. They did not lose a seat in 2012, another presidential year. Fasano, who grew up in New Haven and graduated from Yale and Boston University Law School, said he intends to try to broaden the GOP’s legislative reach in the cities as the GOP leader. “We have a great message for the cities, but we need someone to deliver it,” he said. The only Republican gain in the Senate came in an open race in the 20th Senatorial District, where Andrea Stillman did not seek re-election. It was won by Paul M. Formica of East Lyme. In all, there will be seven new senators taking office on Jan. 7, when the General Assembly convenes. The new Republican senators: Formica, Henri Martin of Bristol and Tony Hwang of Fairfield, all winning open seats. The new Democratic senators: Timothy Larson of East Hartford, Mae Flexer of Danielson, Ted Kennedy Jr. of Branford, and Marilyn Moore of Bridgeport. Moore unseated Sen. Anthony Musto of Trumbull in a primary. The other seats were open. House Republicans unseated nine Democrats, all but one of whom had voted for the gun-control law passed after the Newtown school massacre. They also won two open seats that had been held by Democrats. Rep. Michael Molgano of Stamford, who missed extended periods in Hartford because of illness, was the only House GOP incumbent to lose. The Democratic House incumbents to lose: Joe Diminco of Manchester, Tom Vicino of Clinton, Ted Moukawsher of Groton, Elissa Wright of Groton, Timothy Bowles of Preston, Brian Sear of Canterbury, Christopher Wright of Bristol, Paul Davis of Orange and James Maroney of Milford.